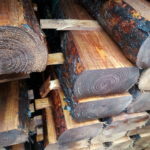 All the railway sleepers for sale on this page are available from stock. 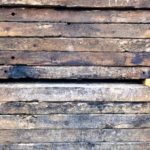 Used railway sleepers – grade “A”, rustic appearance, imperial sizes only. 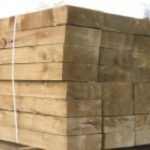 Here at Oakdale we have a number of different variants of railway sleepers for sale that can be used to transform your garden. Our railway sleepers are ideal for a variety of uses. Common uses include creating raised beds, creating steps, used as retaining walls, used as edgings or for transformation into hard wearing rustic outdoor furniture. 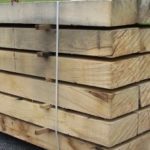 If you are looking for top condition railway sleepers, you might consider our selection of new softwood sleepers. These are great for use all around the garden, and are considerably easier to cut and shape than the reclaimed versions. They are pressure treated with a tanalith preservative which is an environmentally friendly preservative that will protect against insect and fungal damage. 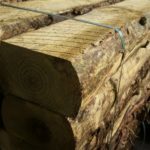 This extends the life of the timber by up to ten times compared to untreated softwood. We provide a green or brown colour treatment option and offer a variety of lengths and thicknesses. Our new oak railway sleepers are landscaping grade, as opposed to beam grade. Like all freshly cut landscaping oak, it is still seasoning and changes character with time. These timbers are mainly square cut but do come with with some waney edges which lend extra character. The oak can also have splits, knots & blemishes. Sometimes the ends can be cut slightly off square and not to a precise 2.4m length. 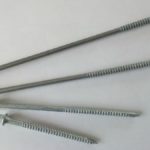 These are ideal even in areas where skin contact may be regular and any preservative used won’t cause problems if you are growing veg or have pets regularly wandering the garden. We have the facility to cut the new 100 x 200 softwood sleepers to size, (for a small charge). If you are looking to cut a used railway sleeper we would advise using a chain saw but beware blades blunt especially quickly on these hard wearing timbers. All our new sleepers are sourced from sawmills that are certified by the FSC scheme. This means the timber used has been sourced from a renewable managed forest. You can buy with confidence knowing your sleepers have not contributed to deforestation or habitat destruction and that the forest that has provided the timber will still be there for generations to come. We deliver right across the Midlands, Leicestershire, Northamptonshire and Worcestershire. Please use the Online Post code/Delivery area ckecker at the top of every page. We can deliver odd sleepers or by the lorry load. We regularly run a delivery service to Coventry, Leicester, Hinckley, Leamington Spa, Stratford Upon Avon, Northampton, Rugby, Solihull, Redditch and Birmingham if you live anywhere close to these locations we can usually deliver within 2-5 days. Check out our delivery page at the top of the site for rates to our standard delivery areas. If you live outside these areas give us a call for a special rate.